If you ae looking fror the ultimate outdoor cleaning machine, then you definitely need to give the D-PG 140.4-9 140 Bar Xtra Dynamic 140 Bar pressure washer with Power Grip a try. As dirt and stains continue proving more frequent and resilient, more and more people are turning to pressure washers for better cleaning results. Whether it’s washing down your garden furniture or giving your car a good hose down, pressure washers have quickly taken over these tasks with ease. Their ability to generate high levels of pressure makes it possible to clean even the most stubborn surfaces around your household. I recently bought the Nilfisk D-PG 140.4-9 Dynamic Xtra pressure washer with Power Grip and here’s what I thought about it. Boasting of some of the most advanced features and capabilities you could want in a pressure washer, the D-PG 140.4-9 Xtra 140 Bar Nilfisk Dynamic pressure washer is ideal for the serious homeowner. The unit sits easy with a very attractive black and blue plastic exterior that quickly catches your eye. This particular washer from Nilfisk offers superior function and durability for almost every type of medium to more high frequency cleanig tasks around the house. This means your patio, driveway, walls, windows, car and any other surface that can stand the pressure. For the more specs inclined user, the Nilfisk Xtra 140 Bar Dynamic electric pressure washer with Power Grip boasts of one of the most powerful motors in the industry. At a whopping 2400 watts of power, there is literally no dirt that can stand up to the pressure. Nilfisk did a great job combining the powerful motor with 140 bars of pressure and 550 litres of flow per hour. It is these factors that allow you to have high and precise cleaning impact for those hard to clean areas. One feature that really stood out was the wide-ranging pressure adjustment. The guys over at Nilfisk understand that some surfaces are more delicate than others. This is why they were kind enough to include 7 different steps of intensity adjustment for surfaces like decorative stone, glass and your vehicle’s number plates. With an endless list of accessories, the 140 bar D-PG 140.4-9 Xtra Dynamic pressure washer has got you sorted. After making your purchase, you are very likely to notice how much work the manufacturer put in to ensure total user-friendliness. 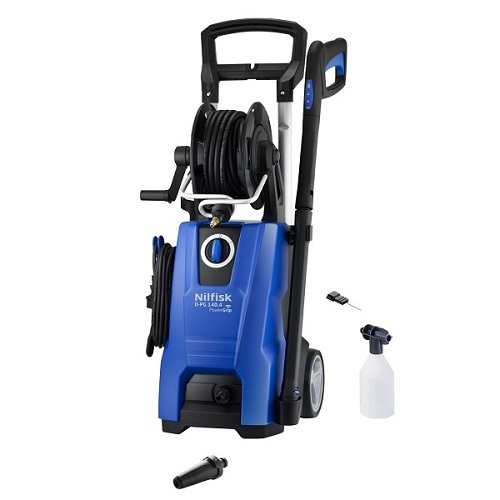 The Nilfisk pressure washer is as easy to use as it is hefty. The unit incorporates an array of technologies that aim to make your cleaning experience much easier. One such addition is the PowerGrip technology that connects the washer’s handles with the powerful motor via Wi-Fi. This is the first time ever that users now have total control of the HPW right in the palms of their hands. The variable adjustment control is cleverly located right at your fingertips and can be easily adjusted as the machine cleans. This way, you don’t have to keep going back to the machine to set the intensity; especially if you are making good use of the 9 meters of included hose length. This particular unit also impresses with its extensive lineup of accessories that make cleaning individual surfaces much easier. You get a vario nozzle and power speed nozzle, foam sprayer for stubborn stains and even a soft grip gun. In addition to being very easy to assemble straight out of the package, the unit also allows for easy cleaning, maintenance, and storage. You can move the unit much easily thanks to the trolley that also allows you to store all your standard accessories. The telescoping handle makes for a great storage after you are all done cleaning. 7 different levels of pressure adjustment. Wireless communication between motor and handle. Some customers claim that the unit is a bit expensive, but the features make the high price well worth it. While the Nilfisk D-PG 140.4-9 Dynamic pressure washer is among the heavier and bulkier models, the manufacturer really put all efforts to improve the mobility. With a long power hose and large wheels for more manoeuvrability, users get more mobility than before. The power grip technology really ushers in a new breed of pressure washers that offer unlimited control and a more fulfilling experience. If you ae looking fror the ultimate outdoor cleaning machine, then you definitely need to give the D-PG 140.4-9 140 Bar Xtra Dynamic 140 Bar pressure washer with Power Grip a try. Whether it is heavy duty cleaning or just some light spring cleaning, the versatile range of pressure levels make cleaning much easier and more convenient. This powerful machine is packed with all the features necessary to leave any surface looking good as new. If you want to see my other top picks among best pressure washers check my pressure washer reviews.